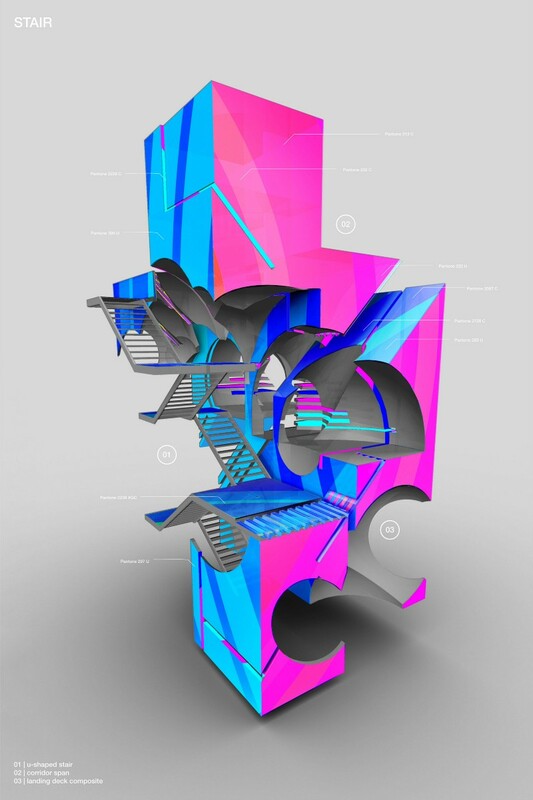 Featured in this week’s UNBUILT post, is Jaime Rivera’s FLAT.obj project. Check out his 3D model here. This thesis investigates the relationship between color and form through the reconfiguration of voids and the shifting of volumes, where the misregistration of one creates an alternate reading of the other. Overlaps and non-geometric alignments of color establish perceptual miscues where identifiable forms (cubes, spheres, and lines) take a turn toward the graphic, identified here as a set of material conditions that stem from logics of paper space and software. These fluctuating relationships between formal operations (shift, slice, taper) and the application of color open possibilities for a perceptual space between the 3-dimensional space of geometry and the 2-dimensional space of the graphic, one perceived and the other imagined. Separate investigations into elevation, section, plan and perspective cultivate discrete forms of attention to the object, as color and form change within each representational convention. For example, perspective showcases the interplay between 2D and 3D that arises when the application of color, which is determined in the abstract world of software, confronts the depth of the physical object’s shadow. This results in a changing set of aesthetic effects that change with the perceiver’s viewpoint. In ‘Art as Technique,’ Viktor Shklovsky describes the perception of everyday life as automatic. According to him, the role of art is “to develop a variety of techniques to impede perception, or at least, to call attention to themselves.” The automated and automatic is the condition this thesis responds to, deploying the graphic to call attention to the perceptual and representational extents of form. 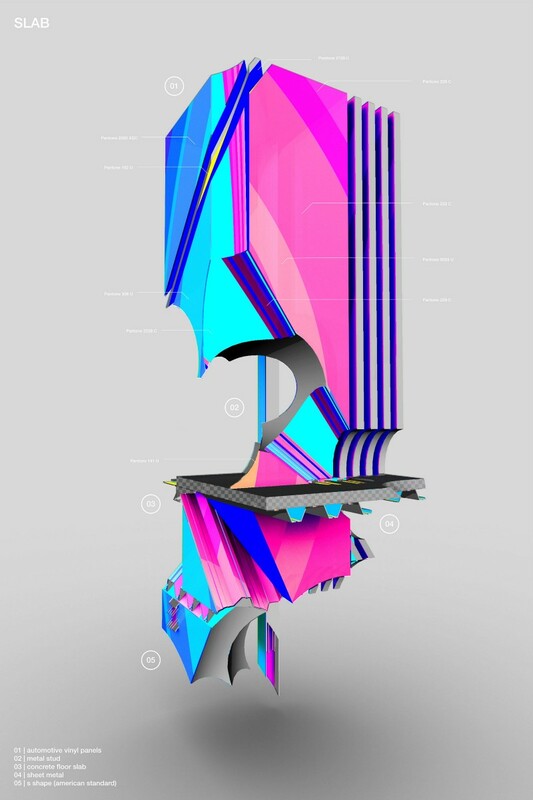 Flat.obj identifies the graphic as a formal register that exists between the digital and the physical, and between architecture and graphic design, combining concepts and techniques from both into a hybrid medium.